Landry caught eight of 12 passes for 39 yards during Sunday's 33-18 loss to Pittsburgh. Landry hauled in 10 of 15 targets for 97 yards and a touchdown during Sunday's 26-23 overtime loss at the hands of the Buccaneers. Landry corralled two of nine targets for 11 yards during Sunday's 38-14 loss to the Chargers. Landry hauled in five of 10 targets for 69 yards during Sunday's 12-9 overtime victory over the Ravens. Landry (knee) doesn't carry an injury designation into Sunday's game against the Ravens, Ian Rapoport of NFL Network reports. 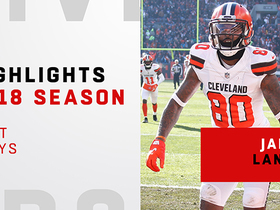 Analysis: Antonio Callaway (knee) is also in line to play Sunday, setting the stage for the Browns to have both of their top wideouts available. Through the first four games of the season, Landry has snagged 24 of his 47 targets for 312 yards and a touchdown. 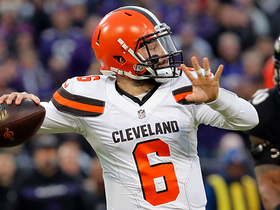 With reliable volume in store and a promising quarterback in Baker Mayfield looking his way, Landry brings a solid weekly fantasy floor to the table. Landry (knee) took part in the portion of Friday's practice open to the media, Tom Pelissero of NFL.com reports. Analysis: Landry didn't practice Wednesday, but he was able to get in a limited session Thursday and looks poised to at least replicate that level of involvement Friday. That seemingly bodes well for his chances of taking the field in Sunday's matchup with the Ravens. The Browns will reveal Landry's official status for Week 5 after Friday's practice concludes. Landry (knee) returned to a limited practice session Thursday. 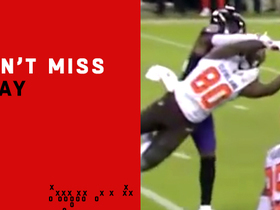 Analysis: As did Antonio Callaway (knee), which puts the Browns' starting wideouts on a course to play Sunday against the Ravens. Through four games, Landry has hauled in 24 of his 47 targets for 312 yards and a TD. With steady volume on tap and a promising QB (Baker Mayfield) throwing to him, Landry should retain a solid weekly fantasy floor as long as he stays healthy. 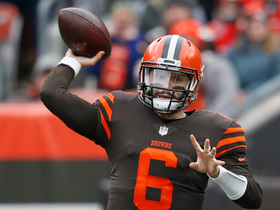 Landry (knee) was spotted on the field for the portion of Thursday's practice that was available to the media, Mary Kay Cabot of The Cleveland Plain Dealer reports. Analysis: It thus appears Landry will be listed as a limited or full practice participant after the knee injury prevented him from taking part in the Browns' first session of the week. There's been no indication that Landry's knee issue is a particularly worrisome one, but his return to full practice before the end of the week would offer some peace of mind for fantasy owners heading into the 25-year-old's matchup with the Ravens on Sunday. Landry (knee) didn't practice Wednesday, Nate Ulrich of the Akron Beacon Journal reports. Analysis: Per Mary Kay Cabot of The Cleveland Plain Dealer, Landry and fellow wideout Antonio Callaway (undisclosed) both worked out on bikes Wednesday. That Landry was able to get some work in suggests that his absence from practice is probably maintenance-related. Such a notion would be supported by his return to the practice field Thursday in any capacity. Landry caught four of 10 targets for 34 yards and a touchdown during Sunday's 45-42 overtime loss to the Raiders. Landry brought in eight of 15 targets for 103 yards in the Browns' 21-17 win over the Jets on Thursday. He also returned two punts for 10 yards. Landry (knee) is listed as active for Thursday night's game against the Jets. Analysis: Assuming he experiences no in-game setbacks, Landry should remain a focal point in the Cleveland passing attack Thursday. 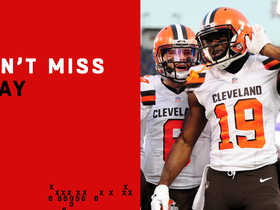 With mercurial Josh Gordon no longer a threat to poach targets, Landry profiles as the Browns' clear go-to wide receiver in Week 3 and beyond. Next up in the pecking order in that realm is rookie Antonio Callaway, with Rashard Higgins currently slotting in as the team's No. 3 option at the position. Landry (knee) is in line to suit up for Thursday's game against the Jets, Mary Kay Cabot of The Cleveland Plain Dealer reports. Analysis: Landry, who suffered a knee injury against the Saints in Week 2, was listed as a limited practice participant this week before being deemed questionable for Thursday's contest. Those who plan to use Landry in Week 3 lineups are still advised to verify his status as the 8:20 p.m. EDT kickoff approaches, but it looks like he'll be able to play. Assuming he experiences no in-game setbacks, Landry should remain a focal point in the Cleveland passing attack. Landry (knee) is expected to play Thursday night against the Jets, Dianna Russini of ESPN reports. Analysis: Landry has been listed as a limited participant in practice all week and was given a "questionable" tag heading into the Week 3 opener. It won't hurt to confirm his status prior to the 8:20 ET kickoff, but it currently appears as if the short week won't be enough to hold the No. 1 wideout Off the field. Should Landry be limited or suffer any type of setback, Antonio Callaway and Rashard Higgins will be waiting in the wings to take advantage. Landry (knee) is listed as questionable for Thursday's game against the Jets. Landry (knee) was listed as limited participant at Tuesday's practice, Nate Ulrich of the Akron Beacon Journal reports. Analysis: Though the knee injury he picked up in Sunday's 21-18 loss to the Saints didn't force an early exit, Landry's practice reps could be capped throughout the week with the Browns facing a quick turnaround between games. Even if he remains limited in Wednesday's session, there's a good chance Landry will be cleared to play Thursday against the Jets. Through his first two games with Cleveland, Landry has served as the team's unquestioned top target, hauling in 12 receptions for 175 yards. Landry was listed as limited on Monday's estimated injury report due to a knee injury, Nate Ulrich of the Akron Beacon Journal reports. 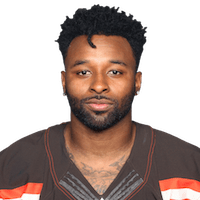 Analysis: Landry has turned in a pair of respectable showings to kick off his first season in Cleveland, accounting for 12 receptions (on 22 targets) for 175 yards. The target count is merely an extension of his usage with his former employer, the Dolphins, but he's currently averaging a career-high 14.6 yards per catch, despite the Browns' passing attack ranking 27th in the NFL. With a knee injury in tow, his status will be one to monitor in advance of Thursday's game against the Jets. Landry grabbed five passes (seven targets) for 69 yards in Sunday's 21-18 loss to the Saints. Analysis: Landry tied for the team lead with seven targets, but because Tyrod Taylor spread the ball around to seven different players, the former Dolphins' wideout wasn't as productive as he was in Week 1 when he surpassed the century mark with 106 receiving yards. Still, Landry's 22 targets over the first two games paints a clear picture that he's Taylor's favorite receiving option, and that should only continue now that the Browns and Josh Gordon (hamstring) have parted ways. Landry caught seven of his 15 targets for a team-high 106 yards during Sunday's 21-21 tie with Pittsburgh. 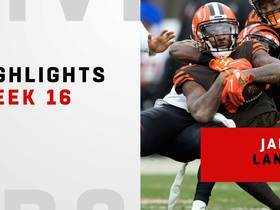 Analysis: Landry picked up right where he left off in Miami, as he led the Browns in receptions, yards and targets Sunday, despite dealing with rain throughout the contest. 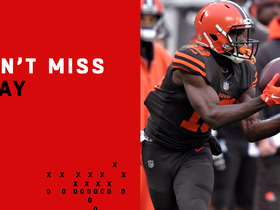 It remains to be seen if Landry will continue to be Tyrod Taylor's go-to receiver once Josh Gordon's "pitch count" is lifted and he becomes a bigger part of the offense. Nonetheless, Landy and Taylor seemed to have a good rhythm together, and they'll try to continue their hot start in Week 2 against the Saints. Landry snatched three of 10 targets for 23 yards during Thursday's 5-0 win over the Eagles. 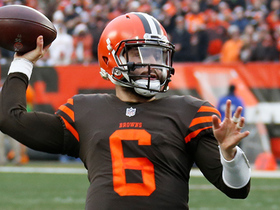 Landry and the Browns' healthy starters seem likely to play for the entire first half of Thursday's preseason game against the Eagles, Spencer Holbrook of the team's official site reports. 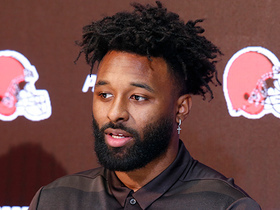 Landry operated as a starter in two-receiver formations at June minicamp, shifting over to the slot in three-wide sets, Mary Kay Cabot of The Cleveland Plain Dealer reports. Landry is poised to sign a five-year, $75.5 million contract extension with the Browns, Ian Rapoport of NFL Network reports. Landry is headed to the Browns in exchange for a pair of draft picks, Adam Schefter of ESPN reports. Landry signed his franchise tender for the 2018 season Thursday, Adam Schefter of ESPN reports. Landry's agent has talked with the Bears and Ravens, among others, about a potential trade for the wide receiver, Jeremy Fowler of ESPN.com reports. Analysis: With no long-term deal expected in Miami, the 25-year-old slot receiver will sign the franchise tag and hope his agent can find a trade with a team that's willing to give Landry the type of contract he's seeking. Baltimore and Chicago would be promising destinations in terms of maintaining his lofty target volume, as both teams have a glaring lack of receiving talent on their current rosters. No trade can officially go through until the new league year begins March 14. Landry will sign a franchise tag with the Dolphins on Saturday, Ian Rapoport of NFL Network reports. Landry has been given permission to seek and facilitate a trade from the Dolphins, Ian Rapoport of NFL Network reports. Analysis: After failing to agree to a long-term extension, the Dolphins placed a $16.2 million franchise tag on Landry last week -- but that doesn't guarantee the wideout will call Miami home come Week 1. It was initially believed that any trade for Landry would have to involve two first-round draft picks, but it has been reported that the asking price has lowered for the Dolphins. Landry is coming off an NFL-leading 112-catch season, to go along with 987 receiving yards and nine touchdowns in 16 games. Landry will sign the Dolphins' franchise tag, Ian Rapoport of NFL Network reports. Landry relayed via the Pro Bowl that he and the Dolphins are "making progress" toward a new deal, ESPN.com reports. Analysis: The wideout is eligible to become a free agent this offseason, but he'd like to return to the Dolphins. Landry's tone Thursday with regard to the negotiations was somewhat encouraging, given that he had previously voiced frustration with how things were moving on that front. The 25-year-old wideout was PRR gold this past season, leading the NFL with 112 catches, en route to logging 987 receiving yards and nine TDs in 16 games. Landry's agent said the receiver is not willing to take a hometown discount to stay in Miami, Joe Schad of the Palm Beach Post reports. The Dolphins have concerns about Landry's consistency and attitude that may impact negotiations for a contract extension, Armando Salguero of the Miami Herald reports. Landry has been selected as an alternate for the Pro Bowl, Adam Beasley of the Miami Herald reports. Analysis: Landry will replace DeAndre Hopkins, who will be forced to miss the game due to an injury. Landry led the league in receptions this past season with 112 but is still a question mark to return to the team next season. He can become a free agent in March and will likely be one of the more sought-after receivers in the pass-happy NFL. Landry may have played his last game for the Dolphins, Armando Salguero of the Miami Herald reports. Landry stated Wednesday that he would like to play for the Dolphins next season, Chris Perkins of the Sun Sentinel reports. Landry brought in five of seven targets for 51 yards in Sunday's 29-13 loss to the Chiefs. He also lost a fumble. Landry snagged 10 of 13 targets for 99 yards during Sunday's 24-16 loss to Buffalo. Landry caught all eight of his targets for 46 yards and had two touchdown receptions in Monday night's 27-20 win over the Patriots. Landry brought in five of six targets for 62 yards in Sunday's 35-9 win over the Broncos. Landry (knee) doesn't carry an injury designation heading into Sunday's game against the Broncos, Adam H. Beasley of the Miami Herald reports. Landry (knee) was limited at Thursday's practice. Analysis: We'll revisit Landry's status no later than Friday to get a better handle on whether his limitations Thursday were maintenance-related, or indicative of a setback, but at this stage we'd still expect the wideout -- who practiced fully Wednesday -- to be a go Sunday against the Broncos. Landry grabbed eight of nine targets for 70 yards in Sunday's 35-17 loss to the Patriots. 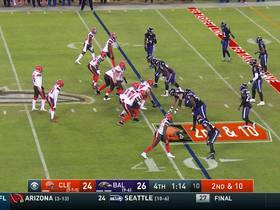 He also fumbled once but recovered. Landry brought in six of 11 targets for 95 yards and a touchdown in Sunday's 30-20 loss to the Buccaneers. He also gained 20 yards on two punt returns. Landry (chest) practiced fully Thursday, Adam H. Beasley of the Miami Herald reports. Analysis: The Dolphins didn't hold a formal practice Wednesday following their Monday night loss to the Panthers, but Landry was still listed as a limited participant in what amounted to an estimation of his status. Landry's participation in all drills Thursday clears up any concern about his health, putting the wideout in line to reprise his usual role as quarterback Jay Cutler's favorite target for the Week 11 matchup with the Buccaneers. Landry was listed as a limited participant on Wednesday's injury report with a chest injury, Armando Salguero of the Miami Herald reports. Landry caught five of 10 targets for 42 yards and a touchdown in Monday night's 45-21 loss to the Panthers. Analysis: Landry hauled in a nine-yard touchdown on Miami's final offensive series to salvage an otherwise forgettable outing. In truth, Landry's performance was representative of his standard this season, as he's caught at least five passes in all nine games yet topped 50 yards just three times. With a tally of five touchdowns now, however, his ability to find the end zone has complemented his ability to move the sticks. Landry caught six of seven targets for 32 yards and a touchdown during Sunday's 27-24 loss to the Raiders.